The Expert Advisor determines trend direction and evaluates the trend strength in percentage (100% means the maximum strength). The maximum value of the trend strength of 100% means the market situation, when the trend expected on a small timeframe is confirmed in the medium term and has the same direction as the long-term trend. No indicators are used for analyzing the market state. Only the mathematical treatment of market data on several timeframes using an original formula. Attention! The EA does not have ambitious targets of predicting the future, it only assesses the current state of the market (of course it can be wrong sometimes). the user is to decide whether to follow the recommendations and trade or not. In the Strategy Tester, the EA is launched with user defined parameters, it can be optimized (due to some tester restrictions, please note that the "PeriodCalc" should not have a value above 12 when running the EA in the Strategy Tester). AggressiveModeMM - select the "aggressive" money management mode (the current balance value is taken into account when calculating the lot). Added ability to select what trends should be analyzed in relation to time. Depending on the specified value (1 or 0), long-term (LongTermComponent), middle-term (MiddleTermComponent) and middle-close-to-short-term (MediumTermComponent) market trends are considered/not considered when analyzing a trend. 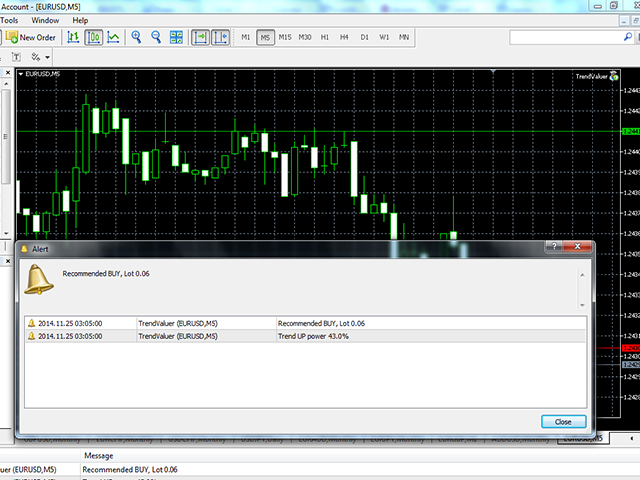 For example, if 0 is selected for all three ranges, that actually means intraday trend analysis mode. This option allows users to adjust the EA operation mode to fit a certain trading strategy.